I Skate, Therefore I Am: Are you ready for Coastal Carnage 2011? One contest after another the pool-park riders of 2011 are unusually busy this summer and every week-end brings its new bowl of international surprises: on June 25th, Marseilles was hosting the Orange Cup at the famous bowl of Le Prado (won by Nolan Munroe with Milton Martinez #2, Alex Sorgente #3 and Julien Benoliel #4), on July 2nd it was Rome with the G-Shock WorldCup and mid-July saw the Mystic Cup in Prague and the Bergfest in Münster, Germany, won by Ben Hatchell. We are now back in the US with the Dew Tour in Ocean City that ended 2 weeks ago (won by Pedro Barros with Ben Hatchell #2 in bowl) the X Games that just finished yesterday with the win of Shaun White in vert, Bob Burnquist in Big Air and Raven Tershy in Skateboard Park. Just when we thought that the Dew Bowl was the 7th wonder of the skateboarding world, the X Games stepped up to the plate with a futuristic bowl full of designs that implement features from some of today’s top skateparks and many Xtreet elements. And the blue bowl at Coastal Carnage is always true to itself, albeit with some new features this year… So, are you ready for Coastal Carnage 2011? The week-end of July 24th-26th 2009 the small coastal city of Huntington Beach turned itself into hell: thousands of people gathered during the US Open of Surfing while Converse hosted their first Coastal Carnage ever. 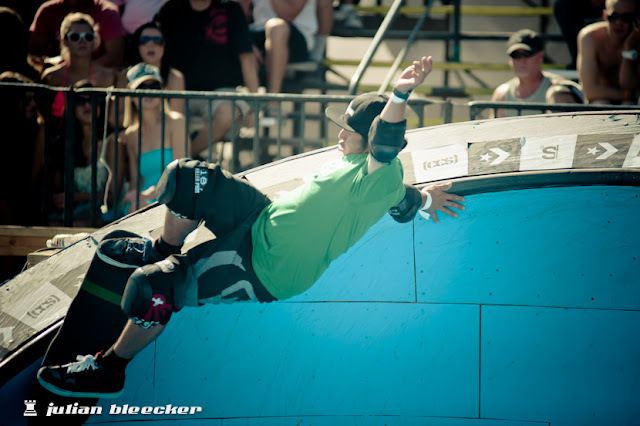 With skaters such as Rune Glifberg (who had flown in that morning from the Dew Tour in Boston) and Christian Hosoi in the contest, the stakes were high but the heats made the grown-ups scratching their heads and wondering what the hell happened to the new kids in the block: a trio of perfect amateur claimed the top spots. The curious pro/am invitational had brought together a hodgepodge of relatively unknown top ams and top pros for a fun-filled and explosive series of bowl jams. The uniquely designed and wonderful wooden double bowl featured a spine, a cradle, and a variety of hips and corners. The bowl was 5' deep with a 7' trans, 2' hip and 7' pocket along with long flat walls just over 28'. The beauty of the ramp is that it was all steel and modular meaning it could become up to 15 different ramps. Too bad the ramp was kept in a hangar for the rest of 2009. The second Coastal Carnage of 2010 went from veneer to Blue Lagoon. 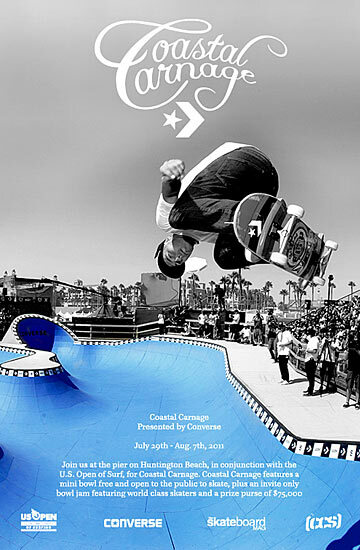 The bummer about Coastal Carnage 2010 is that it was at the same time as the Maloof Contest in Costa Mesa (15mn from Huntington Beach. So, to be at both contests at the same time would have been ubiquitous. 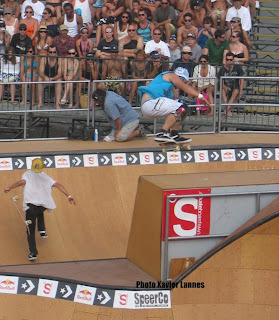 But people like Lance Mountain eventually did both… On the bright side, a new feature of the Converse Coastal Carnage 2010 was the Converse Skate Pavilion, a public mini-bowl, located directly in front of the main course. Anyone with a board was welcomed not only to skate, but also to try out the latest Converse product, free, throughout the entire first week of August. Glifberg, Andrew Langi, Kevin Kowalski and legend Steve Caballero (winner of the Protec Pool Party 2010) with highlights including some of Omar’s precarious Heelflip-Frontside air in the cradle. Heat two was as hot as the California sun and its siblings: Tyler Mumma, Ryan Reyes, Brandon Perelson, Remillard and legend Lance Mountain, all coming from the Golden State. The third and final heat of the event was without a doubt the most intense of the day, and it included Ben Hatchell with his Cabellaerial disaster reverts, who eventually landed 1st. Tom Remillard got 2nd place and Kevin Kowlaski 3rd. Ben Raybourn scored #4 with 360 air to pogo rock and roll. A best trick competition followed the finals with tricks like Wrap-Tail-Block in the cradle (by Kevin Kowlasky), Smith-Grind-to-Fakie in the cradle (by Tom Remillard ) but Aaron Homoki eventually blow the judges’ mind with his Kickflip-Backside-Stalefish and won the stuff. Rune Glifberg only got $4,000? I am disappoint! I've always loved him. Sick skater.